Shakespeare, Shakespeare, Shakespeare. He's that bloke that wrote the second series of blackadder, the one with Queenie in it. Revered thought all of England as 'the bald man with the plan'. The picture in the background is an actual picture of Shakespeare's Globe Theatre in London so take that historical inaccuracy man! When reading about William (that's right, I'm on first name terms with the man) on wikipedia, 2 things struck me as odd. 1)Shakespeare (I made a faux pas and since England was at war with the french he put me back to last name terms) had a son called Hamnet. This proves he cant even spell the names of his own characters. My first son will be called Skeneton Boy in this tradition. Now, I only have ONE bed which I share with my girlfriend and I would assume she would get it when I die as she would still need somewhere to sleep. Why did he have a second bed? Did he have more than 2? Was there a third and fourth? Did he have a thing for beds? Is there a lost play somewhere about his love of beds? A sonnet perhaps? 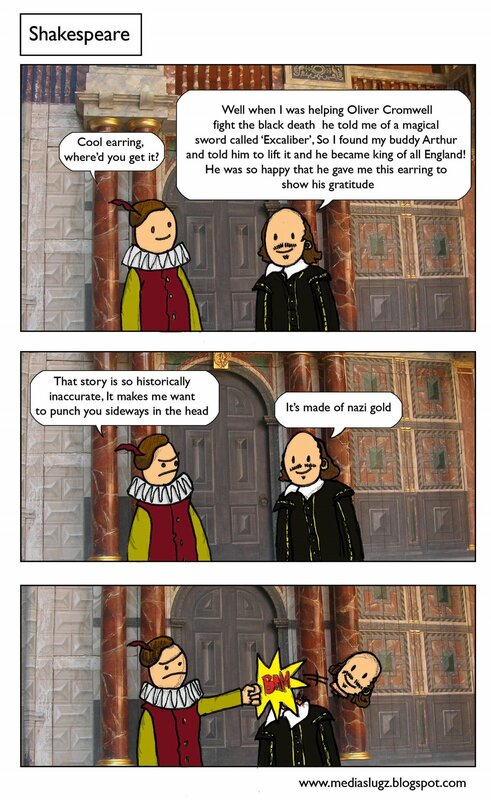 We will never know the madness that reigned supreme in Shakespeare's head but we do know that when it comes to his last will and testament, he was a bit of a douche. PS: I find it amazing that I got through all that without some sort of lame 'two beds or not two beds' pun. 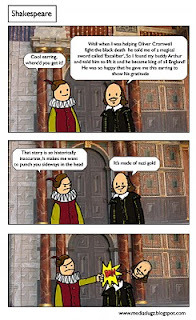 Time for some schooling on olden times! Beds were generally the most expensive item in the household, so to have two beds was like wow! The bed was usually kept in the living room so that it could be shown off to guests, as having a bed gave ypu great social status, seemingly, so she wasn't important enough to merit the first bed! What a wab!